CD36 is another of those cell surface proteins with an interesting use. It actually does quite a few things, but the one I'm thinking about is its role as Fatty Acid Translocase, hence its other name, FAT. The late 1990s seems to have been a fashionable time for CD36 research and this era has provided a number of interesting papers. CD36 takes a molecule of free fatty acid, frequently palmitic acid, and transports it through the cell membrane to the cytoplasm, en route for beta oxidation to provide a bucket load of ATP. Of course, the palmitic acid will also signal the induction of insulin resistance. No point burning glucose if you have palmitic acid. Nowadays any competent lab can knock out a specific gene from a mouse and see if the gene loss does anything much. So in a CD36 knockout mouse we have the ability to make the cell membrane largely opaque to palmitic acid. What does this lack of intracellular fatty acids do to insulin sensitivity? 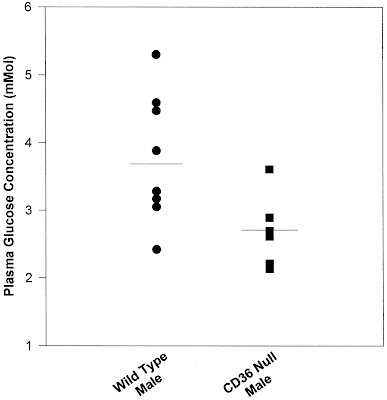 CD36 knockout mice have lower blood glucose than wild type mice. Now this may be hunky dory for a mouse with ad lib access to mouse chow. You can have a nice low blood glucose and probably a nice low insulin level. But what if you were to glycogen deplete the mouse and then make it run to escape from a cat? Its glucose is already low. It can mobilise fatty acids perfectly well, but they can't enter the cells. So no insulin resistance forms and the mouse muscles continue to run on a progressively falling glucose concentration, in a sea of unusable fatty acids, until its brain stops working and the cat gets a mouse sized meal. This hypothesis is untested so far! These mice also have lower blood insulin too (can't check this fully as it's a Nature pay-per-peep publication and insulin is not important enough to make it in to the abstract, so I'm taking Hajri's word on this). All of this is pretty much as you would expect. These mice are born and bred on glucose and virtually never use any palmitic acid unless they make it de-novo, intracellularly, from glucose. They are probably exquisitely insulin sensitive, for what good that might do them in the wild. Over expressing CD36 gives the facility to get lots of fatty acids in to cells and this increases both blood glucose and blood insulin due to insulin resistance. Again, a simple balance, put lots of fatty acids (probably as acyl-CoAs) in the cytoplasm and cells say no to glucose. Hence you need increased levels of insulin to keep blood glucose normal. So is there pathological insulin resistance here? 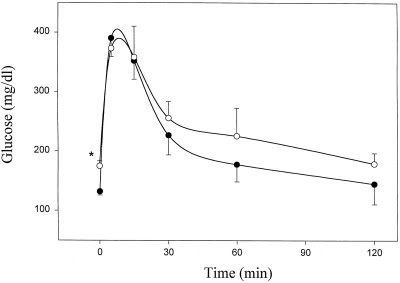 It's worth noting that response to an IV glucose load was NOT damaged in these mice, though there is a "trend towards" higher glucose levels from 30-120 minutes after the bolus in mice over expressing CD36 (open circles). I think it is a reasonable assumption in these CD36 over expressing mice that the insulin surge following the glucose bolus from the IVGTT can still reduce FFAs, and so increase insulin sensitivity, in exactly the way it should to normalise glucose. It seems quite likely that the blood insulin will peak at a higher level in the CD36 over-expressing mice. In general, over secreting insulin is probably a Bad Thing. So should a low carbohydrate, high fat eating person be afraid of eating a portion of chips with their roast bellypork? Will it spike glucose and/or insulin to unreasonable levels? Certainly not. You may have a slightly higher insulin level than a carb eater for an hour or two after 30 grams of potato derived glucose, of course. But a carb eater will not eat a small potato, they will eat ten times that weight of carbohydrate in 24 hours. At least. So a low carbohydrate eater's 24 hour exposure to insulin will be vanishingly small compared to someone nurturing chronic illness using the USA Food Pyramid and eating 300 grams of carbohydrate a day. So OK, is it acceptable to have a portion of chips with your roast (after being marinaded in lemon juice and then rubbed with a Mexican spice mix) belly pork ? Well, that's a personal decision. Me, I'm fine with it. Actually, last night the pork was chip-less but followed by two gluten free muffins for dessert (mostly almonds and millet flour, living dangerously with the millet perhaps). "Obesity implies a failure of autoregulatory homeostatic responses to caloric excess"
The quote comes from this paper first authored by Mario Siervo but with Susan Jebb as the group leader. I'll discuss the paper in a moment. You get the idea. An obesity politico. This sort of politico. Also check the date on that link. 2003. I was just starting on low carbohydrate eating at the time. Jebb was all over the papers. One very obvious thing, to someone who had just read Atkins' "New Diet Revolution" from cover to cover, was that none of the experts being quoted had read the book! This is the table detailing exactly what was eaten. These are the weight changes, also subdivided in to tissue composition. This is the executive summary: People got fat on the excess calories and couldn't loose the weight within 3 weeks. Some people couldn't loose any of the weight at all. Jebb's conclusion. People pig out at Christmas and fail in their New Year diets. Greed and sloth, greed and sloth. Once you've pigged out, if you're greedy, you'll keep troughing. Now, let's ignore Jebb and look what happened. Protein was increased from 85g/d through 101g/d, 112g/d to 126g/d from baseline through over feeding protocol. Some increase, but not unreasonable. Fat was used to increase the "energy density" of the diet and so was increased from 120g/d through 158g/d, 196g/d to 231g/d. The later being Kwasniewski levels for optimal health (but without the carbs!). Carbs started at 322g/d and ramped up through 375g/d, 409g/d to 446g/d. Okayyyyy. Interestingly, just reducing these carbs to a tenth of this overfeeding level would have given quite easy weight loss for most people, with the fat left alone! There were snacks too but they don't affect the basic argument. Jebb is a calories in calories out sort of a person, so fructose is the same as glucose to her. We'll never know how much fructose was fed. With a fat intake of 4.5MJ/d fat oxidation was 4.5MJ/d. Neat that! On 20% overfeeding fat intake went up to 6MJ/d and fat oxidation DROPPED to 3.8MJ/d. On 40% overfeeding fat intake increased to about 7.7MJ/d and oxidation DROPPED FURTHER to 3.5MJ/d. On 60% overfeeding fat intake was 8.5MJ/d and fat oxidation seems to have bottomed out at 3.5MJ/d, no further drop. Carbohydrate oxidation went up as carbohydrate intake increased. This cannot happen without insulin. Increased carbohydrate oxidation means increased insulin, certainly at this level of increase of glucose oxidation. Jebb either doesn't know this, and is an idiot, or does know this and didn't measure insulin for a personal agenda. I favour the idiot theory with Jebb. I guess you could argue insulin sensitivity increased but this is a study of gross overfeeding, so that's unlikely. Fat oxidation decreased with increased calories. What controls lipolysis? Insulin. More insulin, less lipolysis. Less lipolysis means less fat oxidation. Fat is stored more effectively and is locked in to storage. You can't oxidise stored fat. Body water went up. Water retention means sodium retention (water retention without sodium retention = hyponatraemia = death). Sodium retention is a hallmark of elevated insulin acting on the kidneys. 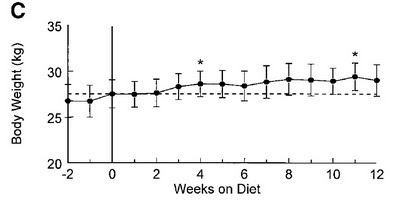 In a short communication the same group measured leptin and ghrelin levels, which indictaed everything should be hunky dory for return to normal body weight, but clearly things weren't. That's assuming leptin satiates and ghrelin makes you hungry. In a simple balance of energy in vs energy out, weight is controlled by appetite. This being a Jebbish paper, they didn't measure insulin. They didn't measure the primary fat storage hormone. Oh, Susan, how could you not do this? So what really happened in this study? Weight gain, to anyone with half a brain, is a phenomenon of the diversion of ingested calories to storage as adipose tissue. Metabolic fuel requirement must be met at the cellular level, above that calories can go to storage as fat. Weight loss means the body gaining access to stored fat calories. Hunger controls eating behaviour when there is no artificial requirement to over eat by 60%. Hunger will adjust food intake until there is an adequate supply of metabolic fuel for the whole body. If a large chunk of those calories consumed go in to storage, even without overeating, you will maintain hunger until you achieve enough AVAILABLE calories which are needed to run your metabolism. Whether these come from food or bodyfat depend on blood insulin level. High insulin levels lock energy in to fat, so you must eat more food to obtain metabolic fuel. Hence you don't lose weight because energy locked in to bodyfat isn't being used. You don't need to measure insulin to know it goes through the roof when you eat nearly half a kilo of carbohydrate in a day. You don't need to measure insulin to know it is elevated when you see fatty acid oxidation plummet. You don't need to measure insulin to know it is elevated when you see glucose oxidation rise. You MUST measure insulin if you want the readers of your scientific publications to think you remotely know anything about weight control and are in a position to advise the nation. Ultimately, the verdict on Susan A Jebb will be that she she did not measure insulin. Oh, and weight loss was impossible for some people, they were the ones who got most fatty liver infiltration per unit fructose ingestion. As a guess. Thanks to Robert for the link to the papers in this post. Physiological insulin restisance: Guess what? There are a series if papers from back in the 1950s by Drury and Wick plus occasional others. I had the misfortune to read the methods of a couple in some detail and, unless you have a strong stomach or are intrinsically sadistic, I suggest you don't. Physiologists in the 1950s had a different view of animal welfare to that now prevalent. The studies would not be allowed in any civilised country today or published in any reputable journal if carried out. I'm not going to link to them. The main finding is that the oxidation of glucose can blocked, even in the presence of large amounts of injected insulin, by a modest quantity of a particular small molecule. This form of insulin resistance, if you want to call it that, does not seem to occur at the cell surface, so it's probably not mediated through the failure of insulin to mobilise GLUT4s. And, as glucose seems to enter the cells and disappear, the presumption has to be that it is "non oxidatively disposed" as the modern parlance has it. Probably to glycogen, there's not really anywhere else for it to go. So what is this evil chemical which blocks glucose oxidation even in the face of hyperinsulinaemia? 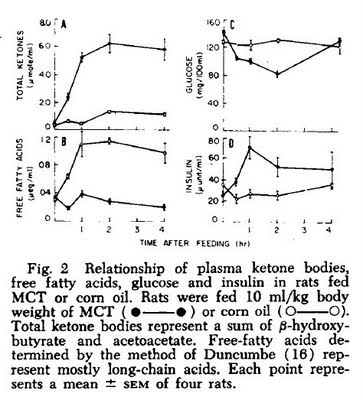 Again ketone bodies, one of the hall marks of carbohydrate or total calorie restriction, channel glucose away from muscles, toward brain and add a modest supplementary energy supply to brain tissue too. It's exactly what you expect on an adaptive basis, exactly the same function as palmitic acid performs and clearly the two metabolic pathways are closely linked, though ketones seem to work downstream of the action of palmitic acid. Anyway, there you have it. Metabolic poison number three, beta hydroxy butyrate. Evolution sure made a lot of b@lls-ups on the way to where we are today. I'm doomed, as always. Labels: Physiological insulin restisance (8) Guess what? People might enjoy O Primitivo's latest excel plot here. I did. I also suspect the effort involved in this is stupendous. Thanks! I like palmitic acid. It causes insulin resistance. Thank goodness. Ted sent me this link. It's depressing. I'm going to discuss a thought drug. I'm going to call it Palmitofake, and it can be developed by Pfizer, no, Fort Dodge. I particularly dislike FD for anaesthesia related reasons. So what does Palmitofake do? BTW, if you didn't need any other hint you can tell this drug is going to bomb as there is neither an x, y or z in its name. Trust FD to screw up (in my mind). Palmitofake is a fluoride substituted analogue of palmitic acid which irreversibly binds to the acyl-CoA interaction site of JNK1 and so inhibits the pathway by which palmitic acid keeps GLUT4 transporters off of the cell surface membrane, whole body-wide. The logic to this is that the lipotoxin, palmitic acid (nature's second biggest mistake, the biggest was obviously cholesterol) can no longer keep glucose out of cells and metabolism can run, unimpaired by fat, for ever on glucose. Woo hoo bring on the glucose. Jim has just done a heavy workout at the gym. Like really heavy and, catastrophe of all time, he forgot his Sportzaide. Sportzaide is a glucose drink used to maintain blood glucose levels during workouts, it promotes sufficient insulin secretion that no fat is ever burned and no glycogen ever depleted. We wouldn't want him to lose weight from exercise would we? So Jim is modestly glycogen depleted for the first time in his life. It's an odd situation but, in the last few million years, it has been known to happen occasionally to the hominids who eventually became us. It's called not having anything to eat for a week before having to chase your diner. If Jim is in government you might argue that brain function is unimportant, but you would be wrong. Jim needs a functional brain, just to stay alive. Whatever else happens, he needs some glucose for his brain. There is no active transport of glucose, it runs down a concentration gradient in to brain cells using GLUT1 and GLUT3. However many transporters are present, if blood glucose drops below 2.0mmol/l Jim is going to be unwell and if it goes below 1.0mmol/l he's going to be very dead. Jim's blood glucose drops. His liver would happily pump out lots more, but it's got none left. His pancreas has stopped producing insulin above basal rates some time ago and is now powerless to mobilise glucose in any way that doesn't need protein catabolism, and this is not exactly a supply on demand source. In the natural order of things Jim will, by now, be mobilising enormous amounts of free fatty acids from his 40kg of beer gut. These free fatty acids rush to his muscles and provide an almost inexhaustible supply of energy. They don't rush to his brain. His brain wants glucose. His brain needs glucose. His brain will have a temper tantrum for glucose. Ultimately it will kill Jim if it doesn't get it. Jim's body, metabolically, is in starvation mode. It needs to stop wasting glucose on his biceps and give it to his brain. The biceps do fine on free fatty acids, the brain dies in a sea of energy without glucose. The trick to staying alive when glycogen depleted is to keep glucose out of any tissue that can cope without it and save almost all of it for brain use. So the rule is, when the body is flooded with free fatty acids, all fat using tissues should stop using glucose. They should see those free fatty acids and internalise their GLUT4 transporters so they don't waste brain glucose on dumb muscle. The message to put this change in place is palmitic acid. PALMITIC ACID CAUSES INSULIN RESISTANCE. YOU WOULD BE DEAD WITHOUT IT. IT'S ADAPTIVE. We should be looking at what gets broken in metabolic syndrome at the cellular energy processing level, not shooting the messenger. And we all know that low fat diets reduce mitochondrial number and high fat diets, especially if ketogenic, increase mitochondrial numbers. I really must get back to those high fat fed mice from 10 posts ago! It's Saturday night. I need a glass of wine and bed! It seems from Dr Lustig's commentary that one specific method of developing insulin resistance is by increasing fatty acid acyl-CoA moieties within a cell. Acyl-CoA is a single fatty acid molecule joined to a CoA group and represents an "activated" fatty acid, ready to do things metabolically. In both muscle and liver it appears to be these activated lipids, rather than stored triglycerides, which are the metabolic signal, via JNK1 and serine phosphorylation of IRS1, which is used to down regulates the activity of insulin on glucose control. This paper suggests high levels of free fatty acids are taken up by the liver and inhibit it's response to insulin. My feeling is that the FFAs can come from hepatic lipase (as above), from overstuffed adipocytes leaking FFAs or even from dietary intake, as lipoprotein lipase spills diet derived FFAs from chylomicrons in to plasma as well as in to adipocytes. Reducing FFA delivery to the liver by inhibiting hepatic lipoprotein lipase does nothing to get rid of hepatic lipid droplets (they have to go out as VLDLs) but the decrease in FFA delivery lowers Acyl-CoA and allows normal liver response to insulin. Is it possible to overload the delivery of FFAs to the liver without in-situ generation of acyl-CoA from either fructose or alcohol? Apparently yes. You can do it by diet. It's not easy, but if anyone wants to try it here's the technique. It works in dogs anyway. There is a key concept in veterinary medicine which states that cats are not small dogs. No one would argue with this, especially those who associate with the superior species. However, dogs might well be reasonably viewed as small humans, it makes a great deal more sense than considering mice to be very, very small humans. So, if someone tells you that they fed a high fat diet to a group of dogs, restricting their caloric intake to weight stability, and that they all developed virtually complete hepatic insulin resistance within a few weeks, you might just have to sit up and take notice. Especially as the fat was cooked bacon grease, provided by the university canteen. Don't ask. The dogs didn't get the bacon (as far as I can tell). This is that study, free full text. Anyway. They initially fed these poor dogs a "can a day" of an Hills "prescription" diet (that's the sum total of the methods info, except the macronutrient ratio in the can) and enough dry diet (some random food made by Wayne Dog Food) to maintain weight stability. They did this for two weeks then took away some of the dry cr*p in a bag and replaced it with bacon grease. About 2g/kg bodyweight of bacon grease. They kept it almost isocaloric with those first two weeks of eating traditional dog food. The idea was weight stability. The agenda was to prove that, under isocaloric and weight stable conditions, fat was bad, bad, bad. Replacing as little as 8% of mixed calories with bacon grease will cause total hepatic insulin resistance. So what does this group consider a caloric intake to maintain weight stability in a 27kg mongrel while it is eating cr@p in a bag? Are you sitting down? This is for a 27kg dog sitting in a cage. Go on, read that again; 3,945kcal/d. I'm not joking. OK, so the first question is whether these dogs were weight stable. Ha ha ha ha. The amazing thing is that they only gained about 2kg during the study period. Make that 3kg if you include the weight gained in the pre study "weight stability" period. 3.0 kg in 14 weeks is >10kg per year. In three years, at this feeding rate, the dogs would weigh >60kg. Some weight stability! Also, there is no control group. I would love to see what 3,885kcal/d of cr@p in a bag would do to a dog's weight in 12 weeks. Waltham's daily energy requirement for a 27kg "typical" adult dog is 1300 kcal/d and for an active dog 1480 kcal/d. Personally I doubt that chronically catheterised laboratory mongrels are getting a huge amount of exercise. So this is another study where the introduction and discussion are utterly divorced from the methods and the results (and from reality). It's worth just flicking through the methods and, in your mind's eye, look at how much money was used on these dogs. A clinical MRI was around about £1000 a shot in the UK Home Counties in 2009. For all this money spent, is there anything of interest in the study? The first thing is that if, like me, you eat somewhere in excess of 2g per kilogram bodyweight of dietary fat every day DO NOT, under any circumstances, add 3000 kcal of carbohydrate to it. If you do this you will develop virtually complete hepatic insulin resistance within a few months. You will also get very very very very fat. Not in a week, but certainly in a couple of years. Thank goodness for this study, saved my liver. Second is that you will not immediately develop peripheral insulin resistance. This will take significantly longer to develop. That's interesting. The liver is the initial site of injury in caloric overload, just as it is from fructose poisoning, or alcohol too for that matter. I might have guessed at muscle/fat for caloric overload. Third is how would Garry Taubes view the achievement of getting a group of medium sized dogs to consume 4000 kcal/d? The equivalent of how do you get a 64kg human to consume 10.000 kcal/d? Challenging. Anyway, if anyone has personally managed to consume 10,000kcal per day for a few years I'd love to know how you are getting on. Foie gras? BTW the really scary features of this paper are that it got through it's grant proposal, it got through scrutineering and it spawned another, even more expensive, project using the same model which also got approved, completed and published. As my wife says, the peer review process is awful, but no one can think of anything less bad so far. Fortunately the group are wasting USA tax payer's dollars rather than my pounds sterling. Phew. Addendum: What's the physiology behind the pathology? Well a dog never eats carbs in the wild, beyond the gut contents of herbivores. It usually takes in a massive caloric load of fat. It needs insulin to store that fat, so fat intake ought to make the liver a little insulin resistant, leak a little glucose and then it's up to the pancreas to sort out the glucose, taking the lipids along with it in to fat cells. This is normality. Adding massive carbs to massive fat will simply break a perfectly adaptive system... That's my take. Don't do it! Just before I get back to hepatic insulin resistance I thought I'd just put this topical paper up, in view of the discussions emanating from the "palmitic acid is going to kill you by hyperphagia" post. It's a classic, coming to me via Barry Groves' book Eat Fat, Get Thin. It took ages to find but is happily available in full text nowadays. Thank you once again to the USA for PubMed. Back in the early 1960s there were still a number of clinicians alive who thought that that Ancel Keys was an arrogant idiot, a crook, or (more likely) both. 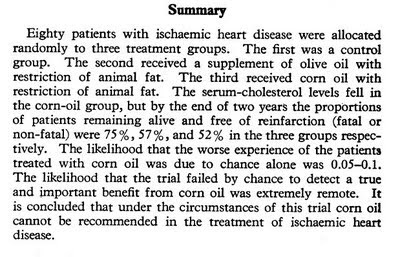 The concepts that cholesterol caused heart disease and that drinking corn oil might prevent heart disease via cholesterol lowering were both ideas suitable for contempt. Hard to say if Rose, Thompson and Williams were part of that perceptive group but anyway, this is the study they carried out. They had three comparable groups of heart attack victims. One third were left alone to eat eggs, cream, sausages etc, you get the message. I was there in the 1960s in England and we ate that sort of stuff all the time, it was just food. Olive oil was a novelty and I'd never heard of corn oil. The other two groups got oil supplements. What did the macronutrient intake end up like? And here are the body counts, the top two lines are the dead people. Bottom right hand corner is the "event free survival" percentages at 2 years. Fascinatingly they had two cases of diabetes, one in the olive oil group and one in the corn oil group. Both occurred on adding the oil and ameliorated on withdrawal. BUT BUT BUT you gasp, saturated fat, PALMITIC ACID for crying out loud, causes insulin resistance. Lovely oleic acid, darling of Dr Clegg's massive project, does not cause insulin resistance. Surely diabetes is insulin resistance caused by saturated fat? Well, it's your life. Clegg says oleic acid is the health nectar of the gods. Rose has noticed a reversible diabetes trigger and has a body count. Your choice! Whenever the lipid hypothesis receives yet another fatal blow, as it does repetitively, there has to be an editorial rushed out with a death reversing ad hoc hypothesis which makes the dead people in the corn oil group pale in to insignificance. Heart attack victims still need corn oil but shouldn't be so greedy and should loose a little weight too. Ad hoc hypothesis number two thousand five hundred and twenty five. Still the body count grows. Not as bad as corn oil but butter is better! Oh, and for anyone who is thinking of having an indwelling catheter placed in to their third ventricle for palmitic acid infusion: Don't. Well, it's Thursday night, only another 20 hours to go until my next doner kebab. Our Friday night habit has become something of a ritual and Glasgow is graced with the most enormous choice of doner shops, certainly compared to Newbury. But the quality is a little suspect on occasions. We have had two kebabs where the grease left in the bottom of the container HAS NOT SOLIDIFIED. This is worrying and I certainly do not revisit those particluar shops. The Anniesland shop by the railway station has turned in to this category. A real doner kebab should leave solid white fat in its container and a coating of thick grease on your lips. This is mutton fat, predominantly stearic and palmitic acids. Real saturated fat is hard when cooled. Runny stuff makes me think it's adulterated with soy oil or sunflower oil... No thank you! Gimme the hard stuff. Anyone with the sort of doner habit I have is well aware of the catastrophic effects of palmitic acid on appetite control. You know what it's like. You go in to a kebab pusher's den, I mean shop, for just "two small doners, no bread, no salad, no sauce", eliciting the ritual response: "What, just the meat?" in a heavy Glaswiegan accent. "Aye, that's right" you confirm, usually with a double thumbs up (I'm learning the lingo, does it show? I haven't dared add "laddie" to this intonation, yet. I value my teeth). Use the same shop twice and you become well known (infamous?). You've promised yourself that you're only going to eat one portion and your wife intends to share the other with your toddler son. WHAT? You don't recognise the scenario? Well that must just be your ignorance of this study and this newspaper article summarising it. I have to say I quite like what I have seen of the study. It's really very weird, in that it actually gives you the exact diets used, in full. That's a bl**dy first in recent "fat bashing" studies. It is also published in a free access journal. This too is very good. It has pretty good control groups etc. I will actually read it in full some time but, at the moment, I just have to comment that it is utterly, totally and completely divorced from my experience of reality. Does anyone else develop driving hunger from a single exposure to lamb fat (or butter, as in the study)? That goes on for days? Which planet do these rats and mice live on? Possibly the same one as the researchers, ie not the Earth! "We fed a highly unsaturated fat diet (30% fish oil) to female Sprague-Dawley rats (180-200g), consumed ad libitum for 8 weeks"
"We propose that female rats fed with a diet containing highly unsaturated fatty acids are an extremely useful model for the study of NAFLD"
I propose this is bullsh*t.
If you are on 3000kcal/d and are going to drink 100ml/day of fish oil as 30% of those calories, PLEASE do not make up the rest of your non protein calories from dextrose. I warned you. Also, if you think this in any way represent the human NAFLD which is rampant in the developed world, please desist from this idiotic idea and send your funding money to me, preferably in used fivers. And go clean that toilet. "These data demonstrate that IHTG [intra hepatic triglycerides], not VAT [visceral adipose tissue], is a better marker of the metabolic derangements associated with obesity"
"These results show that progressive increases in IHTG content are associated with progressive impairment of insulin action in liver, skeletal muscle, and adipose tissue in nondiabetic obese subjects"
Both of these are interesting as they make the liver the centre of the changes commonly found in type 2 diabetes and its precursor, IGT. There are now quite a few observational studies suggesting that VAT is not particularly tightly associated with insulin resistance. I don't think anyone would consider the central role of the liver surprising when you think about the involvement of fructose in this syndrome. Because fructose barely penetrates beyond the liver you would really expect the liver to be the site of its effect on the body. This is a study in PEOPLE, not rats! Note that it only induced hepatic insulin resistance, systemic insulin resistance should take longer. Ultimately, in the longer term, adipocytes will become so full that they too will become insulin resistant, which can then lead to inappropriate NEFA release, muscle insulin resistance and type two diabetes. Obviously there will be genes which determine at what size your adipocytes give up their unfair struggle. So we can look at the genetics of resistance to a functional poison or we can just avoid the poison. I know that latter is a silly idea, but I like it! Just in case anyone doesn't follow Tom Naughton's blog, now would be a good time to start! "There will be much greater interest than is usually the case in the outcome of a review of the scientific evidence for dietary recommendations for patients with diabetes commissioned by the National Board of Health and Welfare in Sweden. This review is not yet finalised and thus not yet published. The appearance of fad diets offering near miraculous health outcomes invariably attracts hordes of adherents hoping for a magic bullet, the books describing them often becoming bestsellers. The ultra-low-carbohydrate Atkins diet was no exception, spawning specialist products, supermarkets, and restaurants worldwide"
"A group of experts which is a branch of the Board was scheduled to publish a report on nutritional recommendations for people with diabetes. However two of the experts on the panel were withdrawn by the newly appointed Director-General. He considered that their links to the food industry via the Swedish Nutrition Foundation might represent a conflict of interest. The Foundation receives food industry funding. It also provides independent advice to the industry through expert scientists. The two scientists involved (Bengt Vessby and Nils-Georg Asp) are internationally respected. Their dismissal caused outrage in the rest of the Board and the scientific community." I think the journalist is using the term "scientist" very loosely here. Personally, if I were either Mann or Nye I'd be thinking what I might do to earn my living if I got the boot in NewZealand in the same way as did Vessby and Asp in Sweden. As always, lavatory attendant would be my preferred re training option for them. Less crying in their beer would be a nice too. But then, if I was as wrong as they are, I'd be crying in my beer too! I happened on Front Row (BBC radio 4) by accident an hour ago. They were discussing Charles Saatchi's new book. There was recounted an anecdote: Saatchi had been asked if it was true he had gone on a diet which required the eating of at least 6 egg yolks a day. The answer was yes, and that its effect was that he had gone from fat and ugly to being thin and ugly. Labels: Saatchi on the OD? When is a high fat diet really a high fat diet? The paper I mentioned some time ago about the preservation of both fat oxidation and cardiac function on a high fat (60% of calories from fat) diet compared to Western diet (45% from fat) is now available in full text for free. The paper is long (10 pages) and detailed and makes anyone touting an apoE-/- mouse, or a fat stupid one, look pretty dumb. It will take some analysis and it's the World Congress of Veterinary Anaesthesia at the moment so I'm not doing detailed reading this week. Are either of the papers dubious? Well, they fit with my personal experience of what it feels like to eat a high fat diet. But then I'm not eating 16% of calories as refined sucrose! Labels: When is a high fat diet really a high fat diet?